I’d like to introduce you to my family’s special kimchi soup recipe today. It’s called kimchiguk in Korean, is very easy to make and it’s a well-balanced “one pot meal” when served with rice. 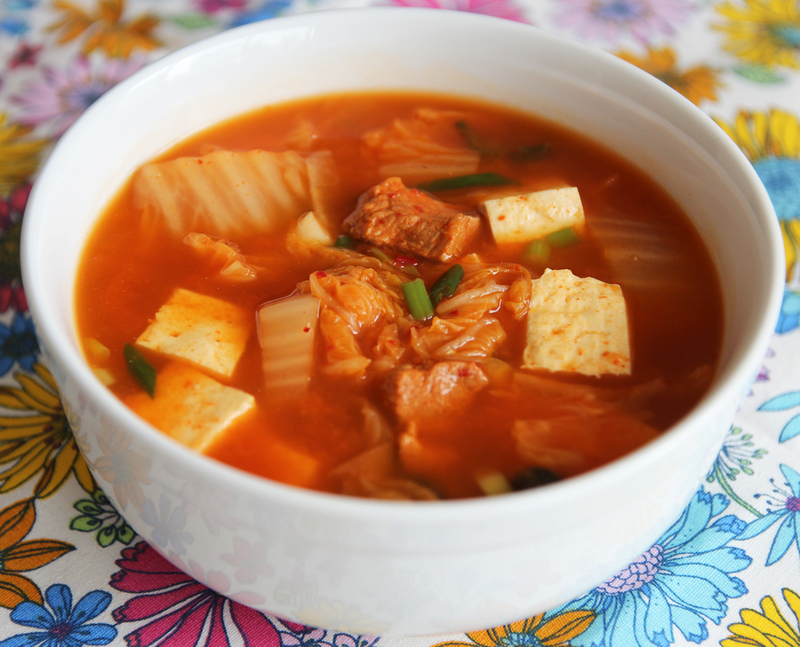 You get the vitamins and minerals from well-fermented kimchi, and protein from pork and tofu. It’s great for the winter: nutritious, warm, and satisfying. Before there were modern methods of preservation and farming in Korea, we had to prepare food for the long, cold winter when vegetables were hard to come by. Neighbors would get together right before winter starts and prepare huge batches of napa cabbage kimchi together, enough to last all of the families involved for the whole winter. This kind of event was called a kimjang. To make sure the kimchi didn’t freeze over the winter, we stored it in onggi crocks and buried in the ground so the temperature was always above freezing and our families could eat nutritious kimchi all winter. Of course, nowadays we have vegetables all year long and electric refrigerators, but many Koreans still make winter kimchi in late November because napa cabbage is in season so it’s fresh, delicious and cheap. It’s still the best time to make napa cabbage kimchi. When I lived in Korea, I usually made winter kimchi in the beginning of December and would eat it until late March of the following year. Like many Koreans living in apartments, I’d keep my onggi on the balcony. When I made kimchiguk, the first thing I did was put on my long red rubber gloves. Then I’d take a stainless steel bowl out to the balcony and get some kimchi. 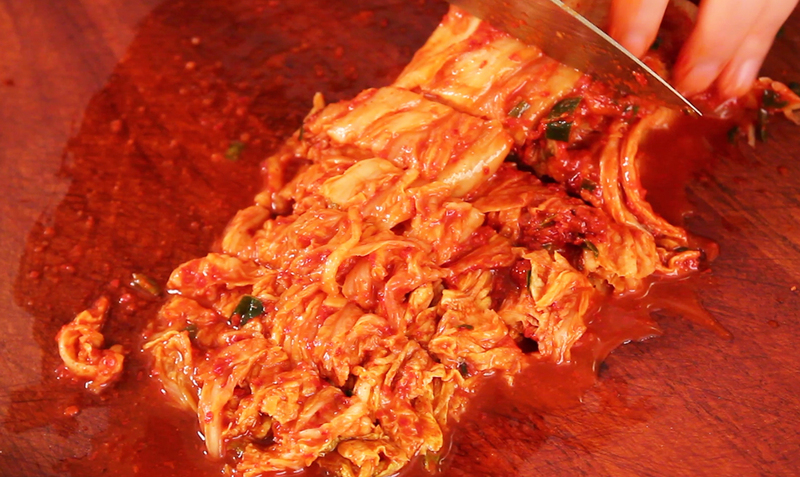 Oh, I’ll never forget the feeling of pressing down on the top of the kimchi in the onggi after taking some out! You’ll never get tired of this soup. 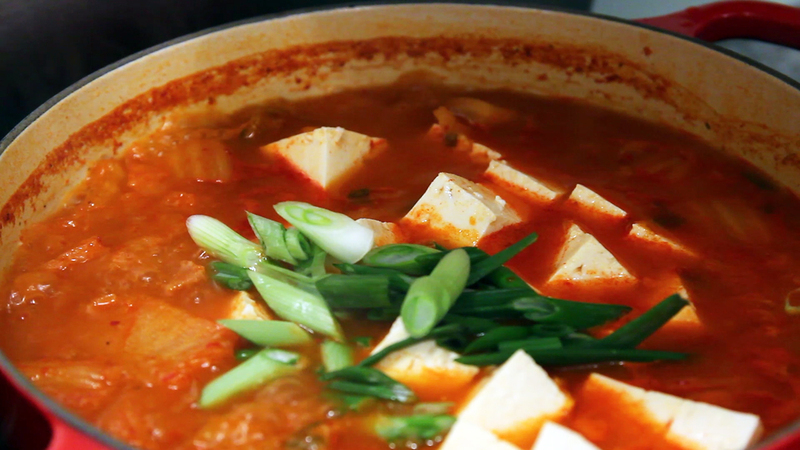 Make this soup and you’ll soon realize why Koreans make such a huge batch of kimchi at the kimjang: we can make hundreds of different delicious dishes with it. 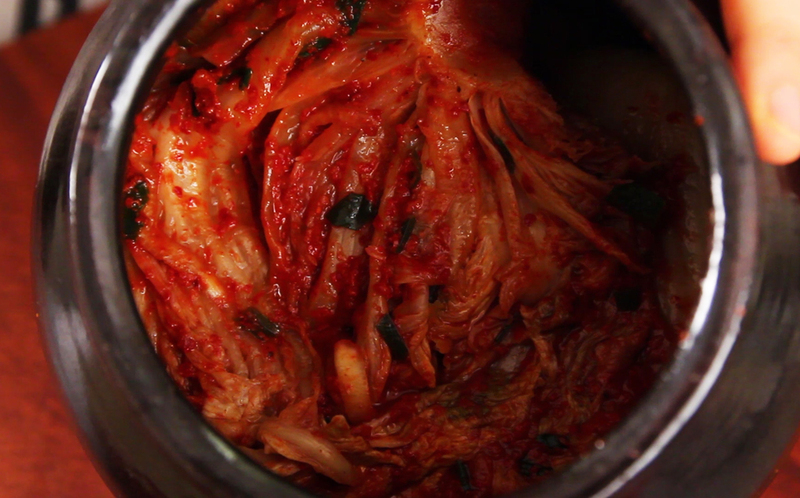 Combine the kimchi, hot pepper paste, kimchi juice, pork, and sugar in a heavy bottomed pot. Add water and bring to a boil over hight heat and cook for 30 minutes. Add tofu and lower the heat to medium low. Cook for another 10 minutes. Add green onion and remove from the heat. Serve hot with rice and a few more side dishes if desired. Posted on Wednesday, February 20th, 2013 at 6:01 pm. Last updated on August 7, 2017. Posted March 26th, 2017 at 2:29 pm | Log in to reply. Posted October 9th, 2016 at 3:25 pm | Log in to reply. will the recipe still be good without tofu? Posted October 18th, 2016 at 4:59 pm | Log in to reply. yes, I sometimes make kimchi stew without tofu. It’s still delicious. Posted September 9th, 2016 at 1:34 am | Log in to reply. Posted July 24th, 2016 at 2:29 pm | Log in to reply. Hi Maanchi! I want to make this soup. Now I have soooooo much flavorful Kimchi juice saved from two large batches of your Kimchi. Can I use just the juice and not the cabbage leaves, and add some fresh vegetables instead? Would that work? What vegetables could work and how much juice do you think I should use for 5 cups water? The juice is sooo good I dont want to discard it! Thank you! Posted April 21st, 2016 at 9:24 am | Log in to reply. Hi! Thank you for everything, you are amazing. What is a red after seaweed salad? Posted March 10th, 2016 at 1:48 am | Log in to reply. As always, thank you for your delicious recipes and your good cheer! Posted March 10th, 2016 at 11:48 am | Log in to reply. I’m glad to hear that you enjoy this recipe. 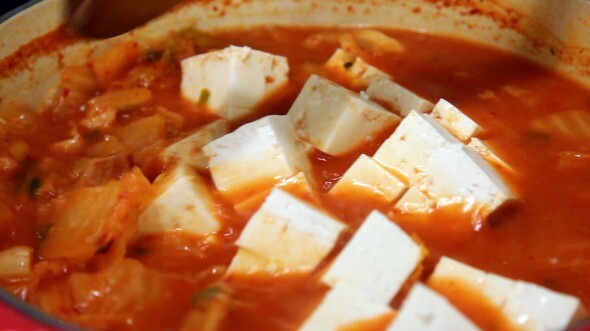 Kimchi soup and rice, ummm~ it makes my mouth water! Posted February 29th, 2016 at 2:00 pm | Log in to reply. Delicious! I love all types of Asian food, and I have tried many of your recipes (10lb of kimchi in the fridge), and with each (of course) as you get more comfortable with them ever cook makes changes. Sadly pork is not on my diet at the moment, but I do make a version of this on the spicy side using a savory broth instead of water (similar to kimchi stew broth) and I use cod and previously frozen tofu cubes (firmer texture and absorbs flavor better). I have also gotten to sometimes adding pineapple and leaving out the sugar as I personally like the savory/spicy/sweet flavor that brings with the kimchi. So that is my personal kimchi soup. Thank you very much for your website. I love your recipes! Posted October 22nd, 2015 at 3:36 pm | Log in to reply. I haven’t been to your website for a while. Love the new doo. Posted October 23rd, 2015 at 10:14 am | Log in to reply. Posted February 8th, 2016 at 2:39 pm | Log in to reply. Maangchi, it is a cold winter day here at the beach and I have been dreaming of making your kimchi soup from the kimchi you showed us how to make. I am now addicted to this soup. Thank you very much for helping us cook. Posted February 11th, 2016 at 1:28 pm | Log in to reply. 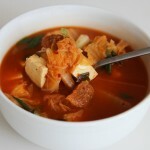 This kimchi soup is my family’s favorite soup made with winter kimchi, pork, and tofu. I’m glad you enjoy the recipe and I feel like you belong to my family. haha! Posted June 4th, 2015 at 3:39 am | Log in to reply. Hi Maangchi! I love your kimchi soup . May I know how much for grams is 2cups of kimchi? Coz I use to buy kimchi at supermarket. They have kimchi per packet of 150g. Posted June 4th, 2015 at 8:42 pm | Log in to reply. I weighed 2 cups of chopped kimchi for you! It says 400 grams. Posted June 4th, 2015 at 11:21 pm | Log in to reply. Thanks! Thanks! Can’t wait to cook this for my husband . Posted May 15th, 2015 at 7:55 pm | Log in to reply. Hi Maangchi I don’t have pepperpaste can I use pepperflakes with water instead? PS: Cant wait to tryout this recipe later on after my kimchi fermented!! Posted May 6th, 2015 at 2:32 pm | Log in to reply. Ooooh yummy!! Maangchi, could you possibly show us how you make multigrain rice? Do you mix different grains together or do you buy it already mixed? It would be so useful to see how you make it, it’s so pretty with all the different colours and textures! Thank you so much! Posted February 28th, 2015 at 4:21 pm | Log in to reply. I love making this soup because it’s so simple! Posted October 9th, 2014 at 10:34 am | Log in to reply. Besides the pork shoulder, how does this differ from Kimchi JJigae? Posted October 9th, 2014 at 4:25 pm | Log in to reply. You can use pork shoulder cut in either kimchi soup or kimchi stew. 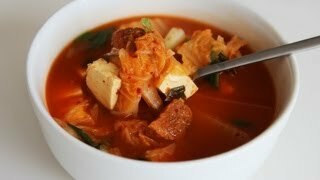 Kimchi jjigae (Kimchi stew) has less liquid than Kimchi soup. And also the soup is less salty than the stew, so you can add your rice to the soup and eat all. Posted June 13th, 2014 at 1:58 am | Log in to reply. Would like to ask you is the hot pepper paste the same as hot pepper bean paste? Posted February 18th, 2014 at 10:20 pm | Log in to reply. hi maangchi! love this site…. made my very first batch of kimchi… soooo excited about eating it already… but i was wondering will it be alright if i made this kimchi soup with fresh kimchi? i am so happy that i dont need to pay AUD12 for a bowl of my favourite korean soup at restaurants ! Posted February 19th, 2014 at 7:52 am | Log in to reply. No, wait until your kimchi turns sour to make delicious kimchi soup. This recipe was originally posted on February 20, 2013 at 6:01 pm by Maangchi. It was last updated on August 7, 2017. The video was watched 857,650 times on YouTube & has 9,184 likes!